Howarth Park after restoration, which included removal of rock armoring, restoring beach slopes, and planting native vegetation. One of five beach renourishment sites after placement of sediment. 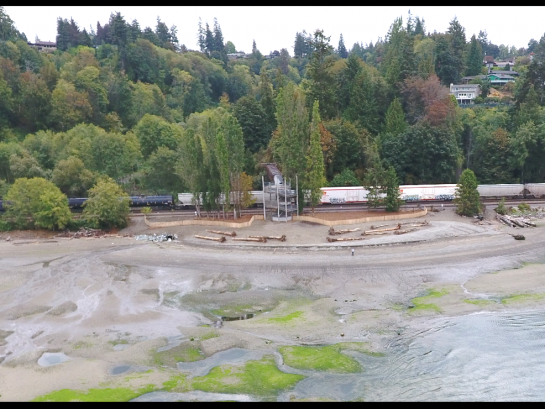 Confluence Environmental Company evaluated coastal processes along 4 miles of Puget Sound shoreline between Mukilteo and the Port of Everett to select priority sites for beneficial reuse of dredge material through beach nourishment and habitat restoration. 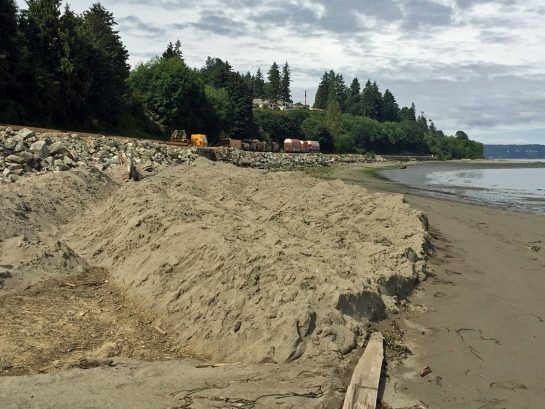 Confluence assisted the Snohomish County Public Works Department (County) throughout the process — from site evaluation to selection of alternatives to construction of this large-scale nearshore beach restoration project. The project goals were to improve shoreline habitat for juvenile salmon and forage fish, as well as improve beach access for the community. Confluence managed the project, led coastal engineering and habitat restoration design, and provided biological and ecological input to the alternatives analysis, feasibility study, and design for the project. The project addressed the disruption of sediment supply and transport processes caused by continuous shoreline armoring associated with the railroad. Phase 1 of the project entailed working with the County and project stakeholders to identify potential nourishment sites along the reach and develop conceptual designs for four sites and 30 percent design for two of them. The project included an evaluation of wave climate, sediment supply, and long-shore/cross-shore sediment transport for the entire 4 miles of shoreline. As part of Phase 2 work, Confluence staff developed 100 percent design plans, cost estimates, and technical specifications for all six nourishment sites. In a separate project, Confluence evaluated strategies for funding future project maintenance, including renourishment. Specific work included development of management strategies for resupplying beach sediments, development and implementation of a communications plan to reach out to stakeholders to solicit input on proposed strategies, and selection of a preferred management strategy with estimated costs and funding sources. 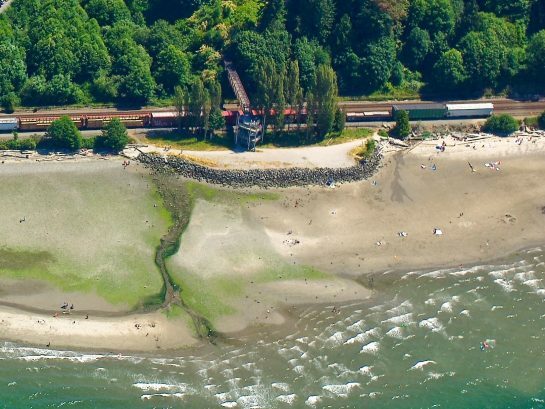 Recommendations will inform future decisions regarding this project but can also be transferred to other beach restoration projects around Puget Sound. The project was constructed in summer 2016 and included beach nourishment at five sites between Port of Everett and Mukilteo. In addition, work at the Howarth Park site included removal of rock armoring and fill on the beach, restoring beach slopes and substrates, and planting native marsh and riparian vegetation at the foot of the access stairway. Project success was due in large part from a collaborative stakeholder process and technical design expertise.